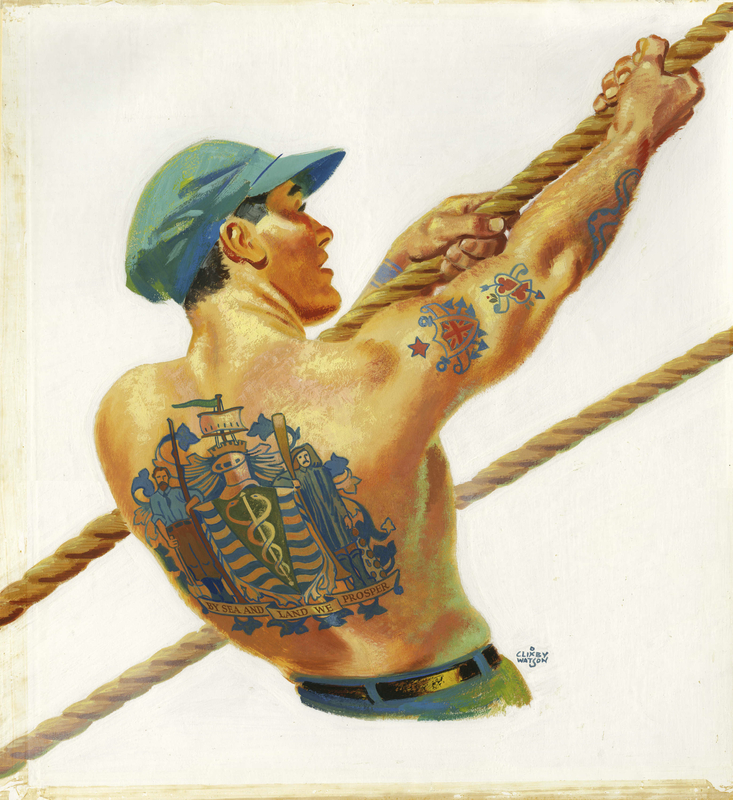 CVA: 72-633 – Tattooed man pulling on rope. Painting by Charles “Clixby” Watson. 195-. This Vancouver longshoreman (I’m assuming) was painted by UK artist Charles “Clixby” Watson (1906-64) sometime in the 1950s. On this fellow’s back appears a tattoo of the Vancouver coat of arms, as it then was. 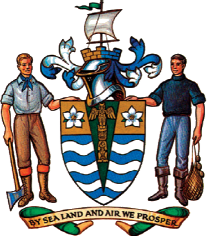 The city’s motto was “By Sea and Land We Prosper”. That changed (along with a number of other elements) in 1969; from then until now, the motto became “By Sea Land and Air We Prosper”. Current Vancouver coat of arms. Adopted 1969. I prefer the earlier coat of arms for a couple of reasons. First, I think the motto is pithier and speaks to the roots of the city. It cannot be denied that air travel has been important in the development of Vancouver, but it can’t be said truly to have been part of the earliest roots of the city. Second, I like that the models in the older coat are more mature. (Ideally, I’d have preferred there to be a male and female.) The two 20-somethings in the current coat put me off a bit. As for the crest that appears on this chap’s right outer bicep, I have no idea what that is. My suspicion is that it came from Watson’s imagination. This entry was posted in art, people and tagged bc, charles "clixby" watson, longshoreman, sea worker, vancouver, vancouver coat of arms. Bookmark the permalink.